These desk items fit into the snack-size zip-top bag on the left. While I always carry pens and pencils with me, as well as business cards and a small notepad, sometimes I need a few more desk items while traveling. I’ve found that by selecting just those particular items, I can still fit everything into my carryon. 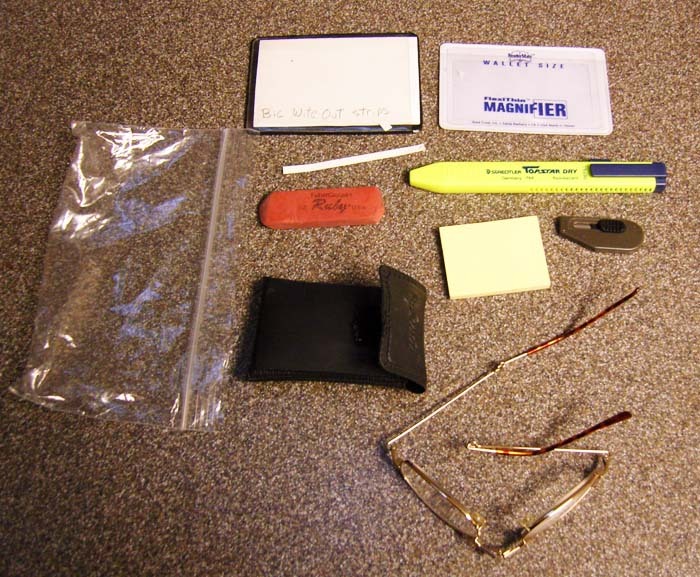 Last year when I met with a coauthor to work on a hardcopy printout of our manuscript, I outfitted a snack-size zip-top bag with folding reading glasses (and its case), a small pad of Post-It Notes, a tiny retractable paper-cutting knife, a flat plastic magnifier, a rubber eraser, a yellow highlighter, and correction strips cut from a Bic Wite-Out roll so they’d lie flat in a plastic sleeve. The items worked well for our particular task at hand. On trips with different purposes, I might replace the eraser with a tiny stapler. Or I might add several paper clips and a small roll of tape. If I plan to write snail mail, I’ll include postage stamps and return address stickers. You get the idea. The key is to take only the items needed for each particular project. If most of the work will be done on electronic devices, a portable “desk drawer” night not be needed at all. Electronic devices weren’t available nearly two decades ago when I flew to Latin America to give a seminar. I’d left home before finishing a literal cut-and-paste job on my lecture notes, so I spread the pages on the plane’s tray table, cut out superfluous verbiage with a small retractable knife, and then taped the sections together appropriately. Although the knife made a soft ripping sound no louder than a sigh, somehow a man trying to sleep in the row ahead of me could hear it above the engines’ roar and kept turning around to glare at me. Personalizing desk tools for each trip enables work to be done with maximum efficiency and a minimum of carryon clutter and weight. And at one’s destination, there’s no need to purchase entire packages of overpriced office supplies—or beg for what you need at the hotel’s front desk—to complete an urgent project. You get bonus points if your desk work is quiet enough not to waken fellow travelers. This entry was posted in Pennywise Packing Pointers and tagged carryon, desk, manuscript, notepad, packing, pencils, pens, Post-It Notes, seminar, stamps, Wite-Out. Bookmark the permalink.